Another offense: The chicken is tender, but the breast meat dries out and tastes wan. 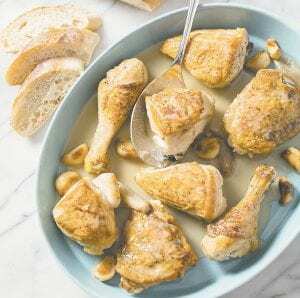 We at America’s Test Kitchen wanted to revisit this classic dish to make it faster and better, so it would boast well-browned, full-flavored chicken, sweet and nutty garlic, and a savory sauce. Using chicken pieces rather than a whole bird ensured that the meat cooked evenly — and quickly. We roasted the garlic cloves first to caramelize them and develop their flavor and then added them to the braising liquid with the chicken. For more recipes, cooking tips and ingredient and product reviews, visit www.americastestkitchen.com . Find more recipes like Chicken with 40 Cloves of Garlic in “How to Braise Everything.” America’s Test Kitchen provided this article to The Associated Press.